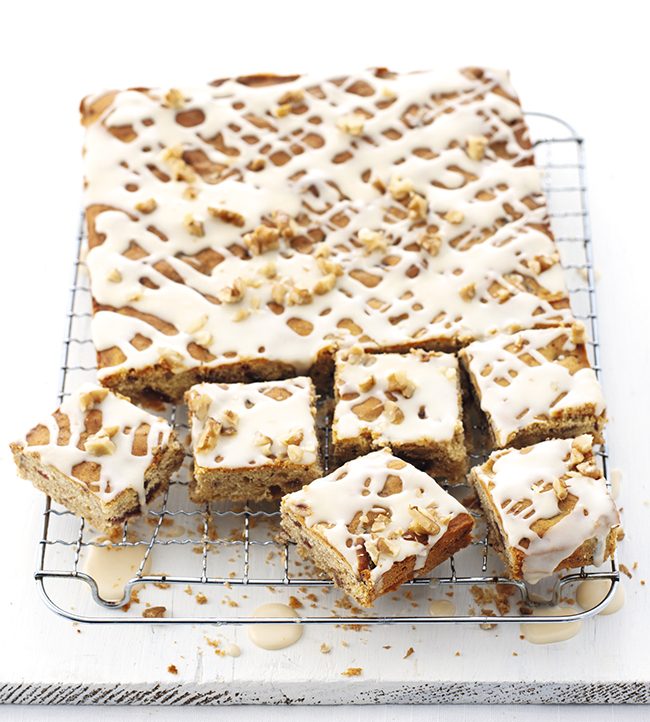 This moist and sticky gluten-free walnut cake is studded with chewy pieces of caramel-like dates and topped with icing for a delicious sweet treat. Chop the dates, place in a small bowl and cover with 150ml boiling water. Leave until cool to allow them to soften. Meanwhile, preheat the oven to 180c, gas mark 4. Line a rectangular tin measuring about 30cm x 20cm x 3cm with baking parchment. Beat the butter and sugar with a wooden spoon or electric whisk until pale and flluffy. Spoon in 2 tbsp syrup, then gradually add a little flour and egg alternately, beating well after each addition until combined. Stir in the baking powder and spice, two-thirds of the walnuts and the dates with their soaking liquid. Mix until thoroughly combined. Tip into the lined tin, level with a spatula and bake for 45-50 minutes until a skewer inserted into the cake comes out clean. Lift the cake out of the tin and place on a cooling rack. Combine the icing sugar with the remaining maple syrup until smooth, adding a little hot water as necessary. When the cake is completely cool, remove the paper, then drizzle the icing generously over the top. Scatter with the remaining chopped walnuts and cut into 24 squares. Using gluten-free flour requires more liquid in the mixture than standard flour, so don’t be put off by the wet nature of this cake mix.